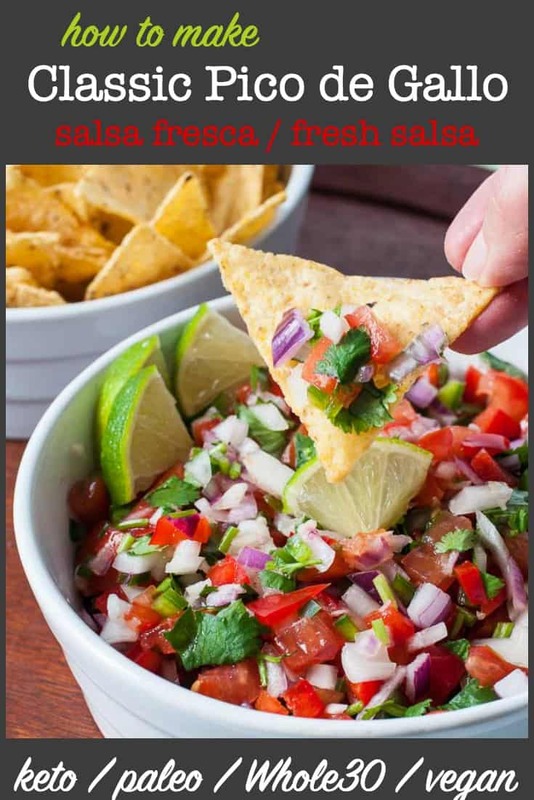 Use fresh tomatoes, onions and peppers to make this classic easy recipe for fresh salsa also known as Pico de Gallo or Salsa Fresca! 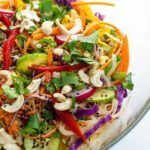 Keto, Paleo, Whole30 and Vegan-friendly! 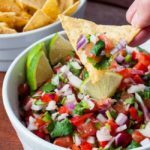 Here’s a classic recipe for Pico de Gallo, also known as Salsa Fresca, Salsa Cruda or simply Fresh Salsa. It’s an uncooked salsa, using fresh vine-ripened tomatoes, red bell pepper, onion, jalapeño, cilantro, and garlic. 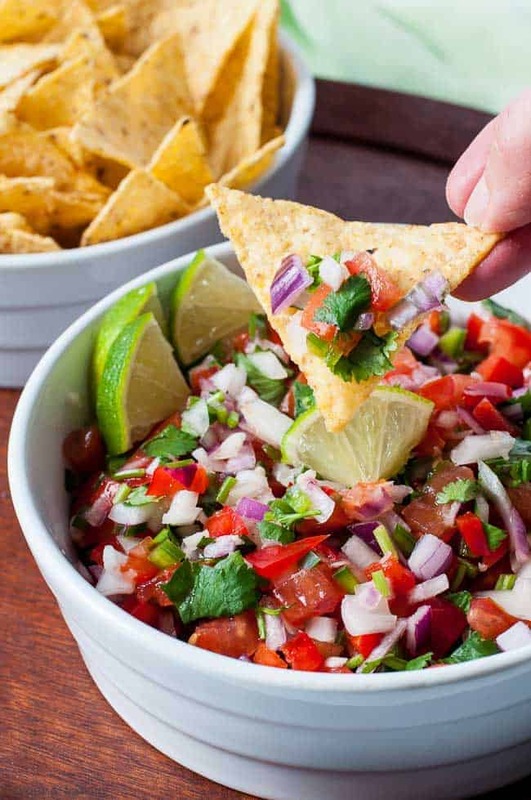 Tossed with lime juice and salt and served with tortilla chips, Pico de Gallo is a healthy snack that is perfect for casual entertaining. Great for scooping! I can’t count the number of times I’ve made this recipe. While it’s fun to eat with tortilla chips, we also love it with tacos, tostadas, quesadillas, or as a side for grilled chicken or fish. It’s a perfect accompaniment to both these appetizers of Chili Lime Shrimp with Fresh Salsa and Bacon-Wrapped Prawns. While fresh produce straight from the garden is often the most flavourful, this week, I searched for the best store-bought ingredients I could find. Armed with a shopping basket of tomatoes, peppers, onions, garlic and jalapeños, I decided that this fresh salsa or salsa fresca should be on our menu. While you can buy it pre-made, it takes less than 10 minutes to make and there’s nothing like the flavour of fresh sun-ripened tomatoes. Homemade is always best! 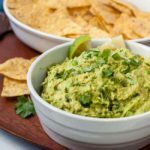 Put these items on your shopping list for your next farmer’s market day and make a batch to have with some tortilla chips, homemade guacamole and good friends. tomatoes: the best quality, firm ripe tomatoes you can find. Roma or plum tomatoes work well in this recipe. onion: your choice: white or red or a combination of both. Red onion will add more of a kick to your salsa. jalapeño: or serrano pepper. One medium, or more if you like lots of heat. garlic: fresh is always best! Chop all ingredients, toss with lime juice and salt and get out the tortilla chips! fresh fruit: mango, strawberries, nectarines, pineapple, grapes, apple, cherries, and even rhubarb! While I think fresh salsa tastes best soon after it’s made, you can keep it in a tightly covered container in the fridge for 2 – 3 days. 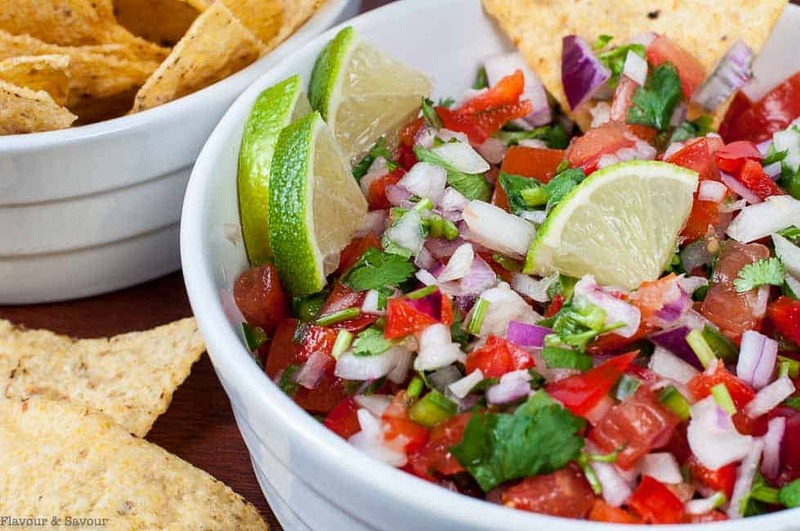 Here are 9 more salsa recipes to inspire you! 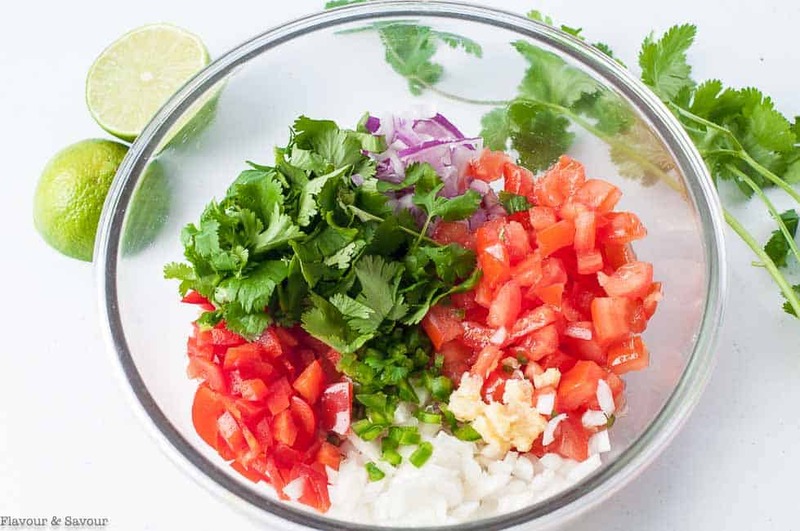 An easy recipe for pico de gallo, also known as salsa fresca or fresh salsa. 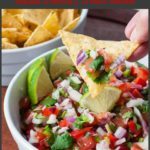 Made with tomatoes, peppers, onions, cilantro and lime, this is a popular healthy snack to serve with chips, on tacos, or with grilled meats. Combine all ingredients in a bowl and toss with lime juice and salt. 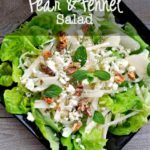 Serve with tortilla chips and guacamole, or with tacos or with grilled meats or fish. This recipe makes 2 cups of fresh salsa.